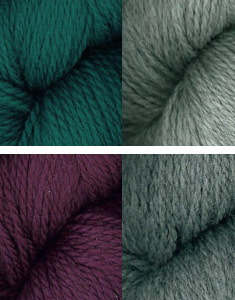 Enjoy this exclusive kit that includes 4 skeins of Plymouth's Homestead yarn in your choice of teal/gray or plum/gray. With this kit you will also get the full digital magazine issue of Knitscene Winter 2015 with the Tessellating Leaves Mosaic Scarf pattern inside. Knit this scarf with a strong color contrasting graphic mosaic pattern. With this kit you will have the essentials to make this stylish accessory: Knitscene Winter 2014 magazine, which includes over 20 patterns for you to explore (along with the Tessellating Leaves Mosaic Scarf pattern), and 4 skeins of yarn in the color combination of your choice. This scarf kit is available in plum/gray and teal/gray. 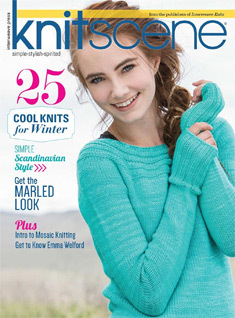 Knitscene Winter 2014 brings you 25 knitting patterns to keep you warm, featuring Scandinavian-inspired knits, marled yarns, and an introduction to mosaic knitting. Featured designer Emma Welford delivers four exclusive patterns while Karen Templer takes us to Tolt Yarn and Wool in Washington. We've rounded up some of our favorite gifts to give knitters and brand new winter yarns to keep your hands busy when you're snowed in! The Tesselating Leaves Mosaic pattern inside is just one of the many exciting, stylish, knits featured! Enjoy the woven appeal that develops from the knitted mosaic pattern. The scarf is reversible and designed wide to let the mosaic pattern be developed through repetition. This stylish scarf uses color wonderfully and is sure to become one of your favorite cozy accessories. The Plymouth Yarn Company Homestead's yarn is 100% wool, 191 yd [175 m]/100 g.
Order the Tessellating Leaves Mosaic Scarf Kit today!